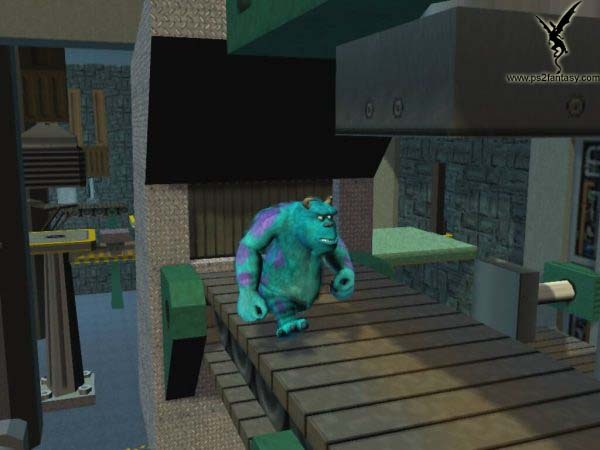 In Monsters, INC. you get to play as your favorite characters from the movie: Mike and Sulley. You get to visit places from the movie trying to get Boo back in her door. But be careful, the CDA (Child Detection Agency) is looking for you. Don\'t get caught! Who do I fight as? As I said before, you fight as Mike or Sulley. Pressing SELECT switches between the characters. They both have their special abilities. Sulley has an average jump, but he can push heavy things around to get you to other places. He fights by scaring people away. Mike is small, so he can crawl into small places and get cool stuff (an extra life, throwing cans, etc.). He also can jump twice as high as Sulley. That\'s very helpful at times. He fights by throwing these cans, if he hits someone they run off. The same thing as the movie. Boo gets into the Monster world through a scaring door and you have to put her back. Several things are in your way though. You can\'t be detected by the CDA, so watch out for him. Also, there is Randal, who you fight a couple of times. He is trying to take Boo and test her on his Scream Machine. If you have a problem with monsters, don\'t get this game. Other than that, it\'s fine. This game is probably more interesting to younger kids, but I had a blast with it. I really enjoyed visiting different places from the movie.